The crystallization process is initiated by a certain degree of cooling and begins with nucleation followed by growth. Heterogeneous nucleation is more common in polymers and can be accelerated by adding nucleation agents. Crystallization processes can be measured via non-isothermal crystallization, cold crystallization and isothermal crystallization. Thermal analysis techniques are ideal for the study of crystallization behaviors, vital to the optimization and processing of materials. 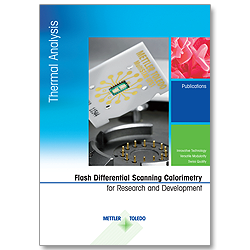 DSC and Flash DSC in particular provide important insight into reorganization processes, whose study requires an extremely wide range of heating and cooling rates. Differential scanning calorimetry (DSC) measures the heat flow produced in a sample when it is heated, cooled, or held isothermally at constant temperature. This technique is widely used to investigate exothermal events caused by crystallization or endothermal melting processes. Flash DSC is a special type of DSC designed for the investigation of such fast processes. With scanning rates in the order of several thousands of degrees per second, this technique is ideal for the study of crystallization under processing conditions. 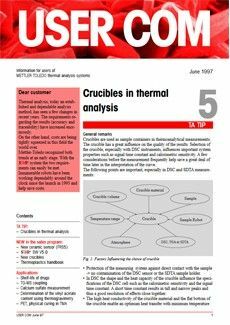 Crystallization processes can also be investigated by thermomechanical analysis (TMA), which measures dimensional changes in materials. TMA necessitates that volume changes are also measured to estimate the percentage of crystallinity. Dynamic mechanical analysis (DMA) measures changes in sample stiffness, mechanical moduli and viscosity. DMA is a sensitive technique for detecting crystallization processes, where crystal formation leads to an increase in the storage modulus. However, the modulus change is not proportional to the degree of crystallinity. Finally, hot stage microscopy is employed for kinetic investigations and the direct measurement of nucleation mechanisms, rate, and crystal growth. Welcome to the METTLER TOLEDO webinar on Crystallization of Polymers Investigated by Thermal Analysis. In this webinar, I describe the crystallization behavior of various polymeric materials and the measurement of crystallization processes using different thermal analysis techniques. Most technically used polymers such as polyethylene, polypropylene and polyamide are partially crystalline. The mechanical properties of these materials are heavily influenced by the crystalline structures formed during processing. Aside from processing conditions, crystallization is also influenced by additives which may either accelerate or slow down crystallization kinetics. Understanding the crystallization processes is therefore essential for improving production processes, optimizing material properties, developing new materials and, last but not least, failure analysis. The diagram illustrates the formation of liquid melts, crystalline solids and glassy solids at different temperatures. The green bar represents the crystalline solid which melts at the melting temperature, tee eff (Tf). Further heating leads to an equilibrated melt that is represented by the yellow bar. If the melt is cooled, it normally crystallizes below the melting temperature and forms a crystalline solid. At temperatures below the melting temperature, the melt is no longer in thermodynamic equilibrium. It is then referred to as a supercooled melt. If a melt is cooled at a sufficiently high cooling rate, the crystallization process is interrupted. A glassy solid is formed at the glass transition temperature. The glass is represented by the blue bar. If a glass is heated, it changes to a liquid supercooled melt at the glass transition temperature. On further heating, crystallization can occur before the melting temperature is reached. In contrast to the crystal-to-melt transition, the glass-to-melt or melt-to-glass transition takes place in about the same temperature range. A direct transition from the glassy solid to the crystalline solid state practically never occurs. In the previous slide, I summarized the typical thermal transitions that are characteristic of semi-crystalline polymers. In the following slides, I will focus in more detail on the crystalline phase and the process of crystallization. The morphological hierarchy displayed here reveals the underlying crystalline structure of polymers on different scales of observation. On the nanometer scale, crystalline unit cells can be observed using small angle x-ray-scattering. Lamellar crystals can be observed on the 10 nanometer length scale. In the sub micrometer range, bunches of parallel lamellas can be seen, as well as the remaining amorphous material in between the crystalline lamellae. This is magnified below to illustrate the different types of amorphous components which are either rigid or mobile, depending on where they occur within the crystal structure. Finally, in the micrometer range, spherulites are observed consisting of radially protruding bunches of lamellae and amorphous fractions in between the lamellae. Now we know what crystals look like. But how are they formed? Crystal formation is preceded by nucleation. A completely amorphous supercooled liquid provides the most favorable conditions for initiating the crystallization process. First, small crystalline nuclei called embryos are formed sporadically through molecular rearrangements. These embryos are unstable and can easily return to the amorphous state. However, as illustrated in the upper schematic, the possibility for crystal growth increases as the nucleus becomes larger. The lower diagram is a plot of the required Gibbs free energy to form a nucleus versus the volume of the nucleus formed by stochastic molecular processes. Below a critical size, this energy increases with increasing volume, meaning that the chance of volume reduction and disappearance is more likely to occur than growth. However, the energy needed to create a nucleus reaches its maximum at a certain volume. This point corresponds to the critical size of the nucleus. Above this point, an increase in volume is more likely. The energy curve eventually intersects the x-axis as the nucleus further grows in size, at which point energy is released and a stable, growing crystal is formed. The maximum endothermic peak – ΔG* Delta Gee Star – is also known as "work of formation of a critical nucleus". ΔG* Delta Gee Star and the critical size are smaller at lower temperatures. Thus, the formation of a critical nucleus is more probable in the lower temperature range. Different types of nucleation add an additional layer of complexity to the crystallization process. The initial formation of nuclei is called primary nucleation, which is either spontaneous or encouraged by foreign particles. Secondary nucleation is characteristic of the crystal growth phase and is induced by already existing crystals. As described in the previous slide, the formation of crystals by homogeneous nucleation is caused by the spontaneous aggregation of polymer molecules in the supercooled melt. Heterogeneous nucleation is induced by foreign particles, or other impurities, which act as nucleation sites. These lower the amount of energy required to form the critical nucleus, thereby increasing the nucleation rate for a certain temperature. Heterogeneous and homogeneous nucleation can be compared my observing the structures formed during isothermal crystallization with a hot stage microscope. Heterogeneous nucleation occurs when initially formed crystalline structures grow over time, without any additional nucleation. This differs from homogeneous nucleation, in which new crystalline structures are also formed; as shown in the upper part of the figure. Nucleation in polymers at higher temperatures is usually heterogeneous, but occasionally, homogeneous nucleation takes place at lower temperatures close to the glass transition, where, as mentioned before, the size of the critical nucleus is smaller. An important property affecting the nucleation rate, other than temperature, is molecular dynamics, which influences the transport of molecules to nuclei. This property constitutes the kinetic component. The thermodynamic component is dominated by "the work of formation of a critical nucleus". This component leads to increased nucleation rates at lower temperatures. The kinetic component shows the opposite effect by increasing the nucleation rate at higher temperatures where molecular mobility is high. At low temperatures, just above the glass transition temperature, however, the kinetic component is low and slows the nucleation rate down. Consequently, the nucleation rate is at its maximum between the glass transition temperature and the equilibrium melting temperature. Secondary nucleation takes place when nucleation is induced by the presence of crystals of the same substance. The reduced critical work for existing crystals speeds up the growth process at higher temperatures. Consequently, the maximum nucleation rate is shifted to lower temperatures and the maximum growth rate to higher temperatures. Overall crystallization, shown in red, is measured by differential scanning calorimetry, or DSC, since the technique is unable to distinguish between nucleation and growth. 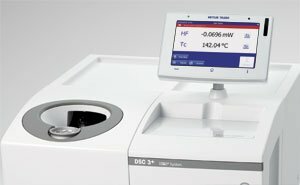 Differential Scanning Calorimetry, or DSC dee ess see, quantitates the energy absorbed or released by a sample as it is heated or cooled. The Flash DSC – a chip-based calorimeter – is ideal for the measurement of fast crystallization processes. Thermooptical Analysis, or TOA tee oh ay. This technique is ideal for crystallization studies. It allows you to visually follow changes in your sample, which is placed in a hot stage, and mounted on a microscope. 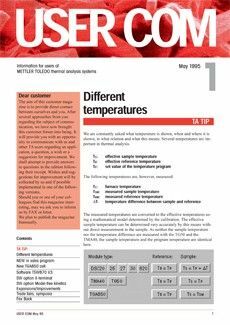 Thermomechanical Analysis, or TMA tee em ay, measures dimensional changes, or the changes in mechanical behavior, of a sample as a function of temperature. Dynamic Mechanical Analysis, or DMA dee em ay, measures the mechanical properties of materials as a function of time, temperature and frequency when they are deformed under a periodic stress. The table summarizes the measured properties, similarities and differences between the four thermal analysis techniques previously mentioned. Differential scanning calorimetry measures the heat flow produced in a sample when it is heated, cooled, or held isothermally at constant temperature. This technique is widely used to investigate exothermal events caused by crystallization or endothermal melting processes. Percent crystallinity can be determined based on the specific melting enthalpy of a completely crystalline material. Conventional DSC, however, is limited by the heating rate, which is about one hundred times too slow for the study of fast crystallization processes relevant for polymer processing. Crystallization processes can also be investigated by TMA, which measures dimensional changes in materials. TMA necessitates that volume changes are also measured to estimate the percentage of crystallinity. DMA measures changes in sample stiffness, mechanical moduli and viscosity. DMA is a sensitive technique for detecting crystallization processes, where crystal formation leads to an increase in the storage modulus. However, the modulus change is not proportional to the degree of crystallinity. Next, I will illustrate each of these techniques using selected application examples relevant for the study of crystallization processes. This first example describes the type of information that can be gained from DSC. Heating and cooling experiments were performed on an amorphous polyethylene terephthalate, or PET, sample. The red curve is the first heating run. First, the sample undergoes a glass transition at about 80 degrees Celsius. The characteristic endothermal step is overlapped by the enthalpy relaxation peak in the glassy state. This is caused by the thermal and mechanical history of the sample, which is removed upon heating. The exothermal peak at 150 degrees characterizes the cold crystallization. The third peak represents endothermic melting. The sample was subsequently measured under cooling. The exothermal crystallization peak on the black curve occurs at about 190 degrees. At this stage, the sample is semi-crystalline with a certain degree of mobile amorphous material. The blue curve describes the second heating after the cooling run. The glass transition of the mobile amorphous fraction occurs at about 90 degrees, followed by the melting of crystals formed during the previous cooling run at about 250 degrees. This slide shows the curves obtained from amorphous PET measured by TMA. The thickness of the sample as a function of temperature is shown in the upper curve, and the coefficient of thermal expansion, in the lower curve. Various thermal effects can be determined from these curves. A glass transition at about 75 degrees Celsius, which is related to the increase in thermal expansion of the amorphous fraction. Above 90 degrees the expansion diminishes and the sample shrinks due to crystallization. This is explained by the difference in density between amorphous and crystalline phases. Changes in the expansion coefficient upon further heating are indicative of reorganization processes. Finally, with the onset of melting at about 230 degrees, the sample's expansion coefficient initially increases before experiencing a sudden drop. The apparent shrinkage is caused by softening due to ongoing melting and the measuring probe penetrates the sample. The DMA shear measurement of amorphous PET pee ee tee is shown on this slide. The first effect is a beta-relaxation, which shows a peak at about minus 70 degrees Celsius. The glass transition occurs at approximately 80 degrees and is accompanied by a decrease in the storage modulus. At 110 degrees, cold crystallization occurs and the modulus increases again. On further heating, the crystallites undergo reorganization as is shown by the broad, weak peak. From about 240 degrees onward, the crystallites begin to melt. The storage modulus (G′) gee prime decreases and the material becomes liquid. Crystallization is also investigated using hot stage polarized microscopy, which offers valuable insight into the type nucleation and crystal growth rate. The photographs show the formation of crystalline spherulites during isothermal crystallization. Initially, tiny reflections are visible, which indicates the onset of crystallization. The second photo clearly shows the growing spherulites, which become significant in the last photo on this slide. These pictures are indicative of heterogeneous nucleation because the number of spherulites remain constant. Crystal growth rate can be determined by measuring the size difference in spherulites from the second and third photographs. As mentioned before, a glass is formed when the melt is cooled sufficiently rapidly. This is illustrated in the diagram. The x-axis is temperature. The glass transition temperature, tee gee (Tg), and the melting temperature, tee eff (Tf), are indicated by the vertical lines. The y-axis is time and is presented logarithmically because it changes by several orders of magnitude. The blue curve is the characteristic time of the crystallization process. At temperatures just below the melting temperature, crystallization is slow and the time is long. Crystallization becomes faster as the temperature is lowered. The characteristic time of crystallization has a minimum between the glass transition and the melting temperature. As the temperature approaches the glass transition temperature, tee gee (Tg), the crystallization rate again decreases due to the decrease in molecular mobility. Crystallization occurs in the temperature/time-region colored green. Crystallization processes can be measured via three different pathways depending on the heating and cooling methods used. The first pathway is non-isothermal crystallization by cooling from the melt, and is represented by the red curve. then measuring the heat evolved while the sample is held isothermal. Alternatively, one can also measure isothermal crystallization by rapid heating from the glassy state to the crystallization temperature. However, the results may differ for these two procedures due to different types of nucleation. If crystallization is too slow to discern the weak crystallization peaks from the isothermal DSC curve we use the stepwise isothermal crystallization method, in which the sample is partially crystallized at different crystallization times, before rapid cooling. The melting effect from the second heating run is then used to determine the amount of crystallinity. Applying these different methods, I will now go on to present some examples of DSC and Flash DSC curves showing polymer crystallization measured via each pathway. Non-isothermal crystallization can be investigated in polybutadiene terephthalate, or PBT, with and without carbon black. Samples were cooled at 10 Kelvin per minute from the melt before running the heating experiment. The red DSC curves were measured for native PBT, while the black curves are from PBT containing 2% carbon black. 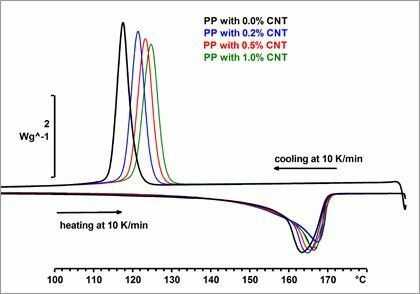 The results clearly demonstrate the influence of carbon black filler on the crystallization temperatures of the different samples, which is higher in the carbon black-filled PBT compared to the original sample. The slide displays cooling curves obtained from measurements performed on isotactic polypropylene at cooling rates between 10 and 500 degrees per second. The curves show how the crystallization peak shifts with the cooling rate. At the fastest heating rate of 500 Kelvin per second, crystallization is almost completely supressed. This next example shows the effect of reorganization on heating. Isotactic polypropylene was cooled very rapidly from the melt at 4000 degrees per second to obtain an amorphous sample. The sample was then heated at heating rates between 5 and 30 000 degrees per second. To facilitate comparison, the curves are displayed in heat capacity units and are also normalized with respect to sample mass and heating rate. In this “heat capacity” presentation, exothermic processes are shown in a downward direction. The glass transition appears at about zero degrees Celsius followed by the exothermic peak due to cold crystallization. The melting peak is between 130 and 150 degrees. The curves show that with increasing heating rate, the crystallization peak shifts to higher temperatures and the melting peak to lower temperatures. At heating rates above 2000 degrees per second, the areas of the crystallization and melting peaks start to become smaller. At about 30 000 degrees per second, crystallization no longer occurs. Even on heating, the material remains amorphous and exhibits only a glass transition. This slide shows the isothermal measurement of isotactic polypropylene using DSC and Flash DSC. The Flash DSC curves between 20 and 110 degrees Celsius show variability in crystallization behavior as a function of temperature. The peak maximum appears below 0.1 s, which is indicative of fast crystallization. The left diagram displays conventional DSC measurements at 130 and 135 degrees. At these higher temperatures, the peak time is in the order of several minutes, which denotes a slow crystallization rate. Fast crystallization can be investigated using Flash DSC, owing to its ultra-high heating and cooling rates. DSC also allows us to investigate the influence of additives on crystallization behavior in polymers. This is illustrated by the crystallization peak times of nucleated and non-nucleated polybutadiene terephthalate, or PBT shown on the right, and polyether-ether-ketone, or PEEK, on the left. In line with classical crystallization theory, the DSC curve of PEEK exhibits a single minimum peak time. In contrast, PBT shows two different crystallization processes: one at low temperatures with a minimum peak time of about 80 degrees Celsius, and another at 140 degrees. Only at the higher temperature is crystallization accelerated by the nucleating agent. I'll now conclude the topic of isothermal crystallization with an example of a method used for crystallinity determination in slowly crystallizing materials. Polyethylene terephthalate (PET) samples were initially cooled from the melt to 225 degrees Celsius at the maximum cooling rate. At this temperature the samples were crystallized for four, ten, twenty, forty and sixty minutes before rapid cooling to room temperature. The subsequent heating curves are displayed on this slide, which were used to determine the percentage crystallinity by integrating the areas under the crystallization and melting peaks. The plot on the right shows a positive correlation between the percentage crystallinity and crystallization time. Next, I would like to focus on reorganization processes, or more specifically, how crystallization conditions affect the final structure of materials. Earlier on, we learned how crystallization rates decrease at relatively low and high temperatures, with a maximum crystallization rate between glass transition and melting. At high temperatures, the crystallization process is dominated by the nucleation rate. In this region only few nuclei are formed and the crystals will grow to relatively large structures, which are relatively brittle. At lower temperatures, the crystallization process is dominated by growth. The decreased molecular mobility reduces the crystallization rate. In this case many nuclei exist, leading to the formation of numerous small crystals. This results in a more ductile material. Different types of crystals result in a huge diversity of materials with characteristic melting temperatures. Crystals formed at low temperatures are small and also melt at lower temperatures compared to larger crystals. Consequently, these crystalline structures are not stable when heated and may reorganize to form more stable crystals. This reorganization effect will be discussed on the next slide. Reorganization processes during heating influence the structure of materials and can be altered or even suppressed depending on the heating rate. Examples of typical reorganization processes are phase separations occurring in mixtures or alloys. In polymers, small, unstable crystallites first melt and recrystallize on further heating to form more stable crystals. The heating curves on this slide show the effects of reorganization in isotactic polypropylene. Before each measurement, the sample was cooled at 1 degree per second from the melt. The heating runs were then performed at different heating rates between 10 and 2000 degrees per second. If no reorganization occurs, one would expect the maximum of the melting peak to shift to higher temperatures at higher heating rates. This is the case for heating rates above 200 degrees per second. At lower heating rates, the opposite behavior is observed due to the formation of more-stable crystals that melt at higher temperatures. Determination of the initial crystallinity of nearly amorphous polymers is a known application of DSC. The crystallinity can usually be determined by evaluating the melting enthalpy and dividing it by the enthalpy of a 100% crystalline material. The data for 100% crystalline materials can be obtained from many databases. Nearly amorphous polymers however have the tendency to go through cold crystallization during heating and to subsequently reorganize. Consequently, all crystallization and melting events have to be taken into the account during evaluation of the curves. Here we discuss the example of polyethylene terephthalate, or short “PET”. The blue curve shows an example of the evaluation of the crystallization peak and the melting peak. The difference of the two enthalpies is 9.64 J/g. The initial crystallinity of the sample before the two transitions was relatively high. The difference between the enthalpies is due to subjective selection of baselines. The baseline represents the behavior of an amorphous material. For a nearly amorphous material we can draw the baseline from the point on the heat flow curve after the glass transition to the curve region of the molten material. This is shown on the black curve. 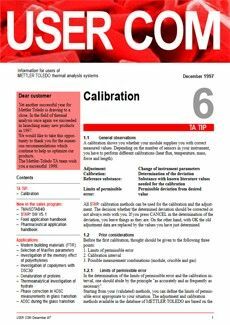 The evaluation result is now 5.35 J/g, which is much smaller. . For amorphous PET we usually obtain values around 4 J/g. The reason why this value is not zero, even for completely amorphous PET, is the temperature dependence of the melting enthalpy. This dependence is shown in the inserted diagram. Taking this into the account, the measured enthalpy is zero within the accuracy of the experiment. A detailed description of this correction is given in the literature. Finally, I would like to conclude this webinar with a quick summary of the main points discussed. Crystallization is initiated by a certain degree of cooling and begins with nucleation followed by growth. Heterogeneous nucleation is more common in polymers and can be accelerated by adding nucleation agents. Crystallization processes can be measured via non-isothermal crystallization, cold crystallization and isothermal crystallization. Finally, I would like to draw your attention to additional information downloadable from the internet. METTLER TOLEDO publishes on thermal analysis twice per year in their expert Thermal Analysis UserComs. 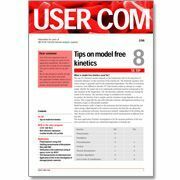 Articles applicable to the topics covered in this webinar are listed on the slide. Dedicated webinars on the techniques introduced, including DSC, Flash DSC, TMA, DMA and TOA, are also freely available. This concludes my presentation on "polymer crystallization by thermal analysis". Thank you very much for your interest and attention.